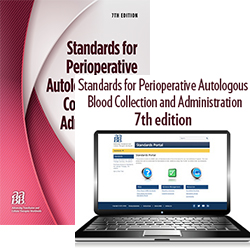 This combination provides two ways to access the 7th edition of Standards for Perioperative Autologous Blood Collection and Administration: print and electronic. This edition of Standards for Perioperative Autologous Blood Collection and Administration (Perioperative Standards), effective January 1, 2017, contains requirements that address perioperative collection and preparation of red cell and non-red-cell components. Its goal is to maintain and enhance the quality and safety of perioperative autologous blood collection and administration and to provide a basis for the AABB Accreditation Program. A multi-user license is available for this product at a discounted rate. 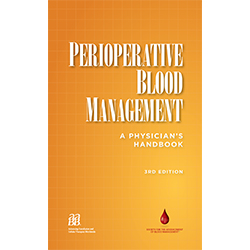 The 7th edition of Perioperative Standards, effective January 1, 2017, details the latest standards of practice for accredited blood banking and transfusion facilities. The Standards Portal allows users to customize their profile based on the activities for which they are accredited and can be rearranged at any time. Standards that do not apply to a user’s profile will appear grayed out to ensure that purchasers are aware of the standards that apply to their facility and those that do not. All links to outside websites and cross references to other standards in the portal are live and appear in popup windows to allow users to be able to see both the standard in question and the linked post. The full edition of the Perioperative Standards (not including any guidance) is printable at any time to ensure that users can take the Perioperative Standards on the go. By purchasing the Standards for Perioperative Autologous Blood Collection and Administration, 7th edition (“Standards”) through the AABB Standards Portal (“Portal”), users acknowledge and agree that they will access the Standards solely for their own personal and/or professional use and not distribute, copy or provide access to the Standards for use by any third parties. Furthermore, users will securely maintain their login and password for the Portal. In the event that AABB or its authorized agents discover that users have not complied with these Terms and Conditions of Use, they understand that they will lose all rights to access the Standards and will not be entitled to any refund.